Choosing the right color palette for your home can be overwhelming. With thousands of paint colors out there, which one is right for you? Color is the design element that has the most impact on your senses. It “colors” the way you feel and it changes depending on the quality of the light in a space. Have you ever chosen a paint color at the store, brought it home, and it looked completely different on the walls? What about asking your friend for their paint color, painting your walls, and then it didn’t work for you? Our Color Palette and Paint Color Consultations are your solution. We bring the color samples straight to you. We also explain why the color will work and can provide large samples for you to place on the wall for viewing at different times of the day and night before you ever pick up a brush. 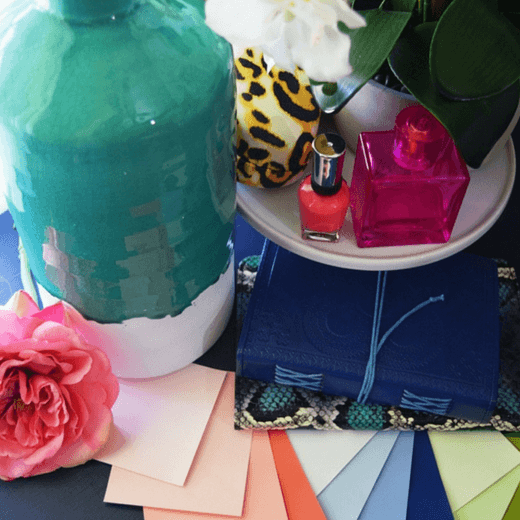 Why is a Color Palette & Paint Color Consultation Right For You? You may have already spent hours looking at paint fan decks and fabric swatches. Not to mention the time spent online endlessly scrolling for inspiration only to realize that there are too many choices. This takes time away from things that are important to you like family and friends. We can narrow the options at our meeting so that you quickly feel confident in your choice. Each can of paint, sample fabric swatch, and furniture mistake costs you money. After our meeting, we can provide large 8″ x 11″ paint swatches sent to your home on which you can base your final color decision. We also recommend that you paint a sample on the wall before you buy the whole can. We have a library of fabric swatches that you can see and feel in person before you decide as well. A little time spent with us can save you from costly mistakes. If you are selling your home, we can advise you on what’s popular right now and what buyers are looking for. If you plan on staying in your home for a while, we can help you pull together a palette based on what you love and making it feel current. We know that color is subjective and not everyone agrees with each other. Everyone has their favorite colors and have meaning attached to them. We don’t take sides, but we can find ways to mix and match everyone’s preference to come up with a color palette that includes everyone in the process. Sometimes you have a great color palette picked out, but you aren’t sure where and how to use each one. The colors are beautiful, but they don’t seem to flow. You’re having a hard time finding the right balance of shades and tints to make it work in your home. We can look at your current color palette and find ways to make everything flow together that will bring balance and harmony to your space. If you are ready to schedule your Paint Color Consultation or have any questions regarding our services, please click the button below to leave an email message or call us today. The cost for our Paint Color Consultation Service is $150. if you would like to add an interior design or feng shui consult, our Design Work Session is only $250 for up to two hours.